Tune in to Live Constructions this Sunday to hear a short interview with Jooklo Duo (Virginia Genta and David Vanzan) and Bill Nace. The free jazz project have recently finished a short stint in NYC, and now we sit down with them in our studios to hear about their tour, future studio plans, and more. Listen! 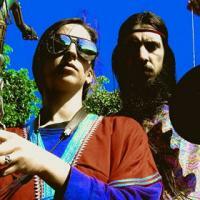 Jooklo Duo is a free jazz duo from Rome, Italy, formed in 2004 by experimental musicians Virginia Genta and David Vanzan. Virginia Genta is self-taught and plays saxophone, flutes, clarinet, plus some percussion and keyboards. Since 2003 she's been working with drummer and percussionist David Vanzan in several projects such as Jooklo Duo, Neokarma Jooklo Trio (or Sextet, Octet, Experience), Golden Jooklo Age, and the Jooklo Finnish Quartet. She started playing music from improvisation while quite young, and has always been moving in the music cosmos with a deep, natural and spontaneous approach to creation, constantly working to find the highest way of expression connected to the oneness of universe. Besides this, the devotion of Virginia finds freedom also through drawings and illustrations. A restless activity during the past few years (about 400 concerts and a countless amount of recording sessions, some of those released on labels like Qbico, Conspiracy, and her own Troglosound), brought her to collaborations with musicians like Chris Corsano, Paul Flaherty, Bill Nace, Sonny Simmons, Daniel Carter, Sabir Mateen, John Blum, John Paul Jones (Led Zeppelin), Takehisa Kosugi (Taj Mahal Travellers), Merce Cunningham Dance Company, Sonic Youth, Hartmut Geerken, Famodou Don Moye, Makoto Kawabata, Andrew Barker, Muruga Booker, Raymond Strid, Giorgio Pacorig, among others. Bill Nace is one of the premiere avant-garde guitarists active today. With one of the most personal and unique palettes of sound ever to be culled from an electric guitar, Nace creates a distinct, mind-bending cacophony focusing his textures with intense precision and control. In addition to touring internationally with Kim Gordon as Body/Head, nace works under various guises including x.0.4 with Jake Meginsksy and John Truscinski, a duo with Paul Flaherty, Northampton Wools with Thurston Moore, and Ceylon Mange with Dylan Nyoukis and Karen Constance, as well as under his own name.